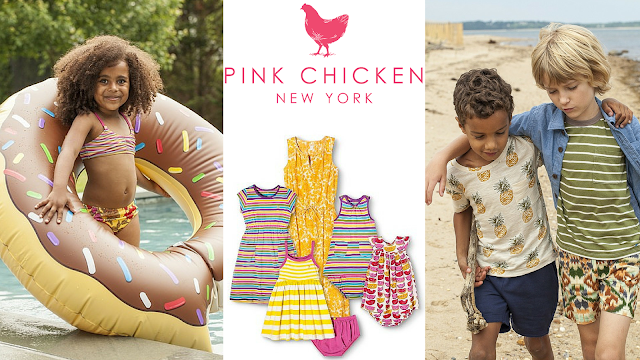 Pink Chicken is a must-have bohemian-chic clothing line for babies, kids, and women by designer mom and fashion industry vet Stacey Fraser (who also designed for Ralph Lauren and BabyGap. This Year, Pink Chicken is doing something new and cute! 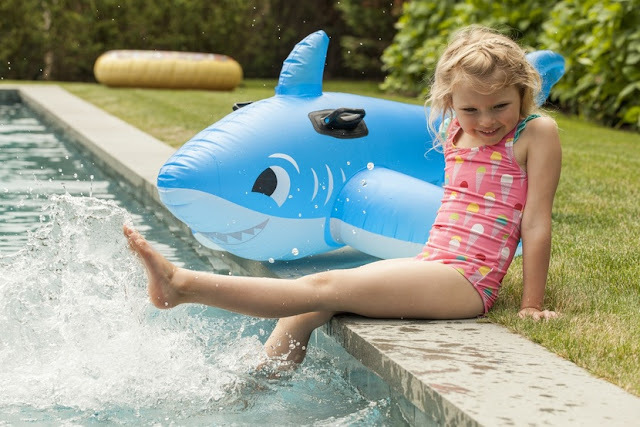 Pink Chicken is celebrating its 10th anniversary this year with the launch of two new lines: Blue Rooster for Boys and Swimwear for Girls. The Blue Rooster and Pink Chicken Swimwear collections are now available at all four of Pink Chicken’s retail shops in New York City, Amagansett, Santa Monica and Charleston, as well as in top boutiques nationwide. Since mastering the art of designing clothes for moms and their mini-me’s, Stacey Fraser knew she couldn’t leave her friends with little boys behind and decided to “hatch” Blue Rooster. 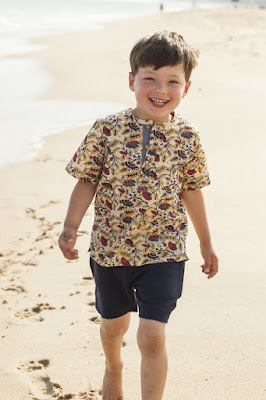 She took what she most loved about Pink Chicken – print, pattern, and color – and created an equally stylish line for boys that focuses on comfort and softness. The collection features t-shirts, button-downs, shorts and draw string Harem pants, all in an earthy palate with blue and green highlights and vintage and boho-surf shapes and cuts. T-shirts range from solids and stripes to fun prints featuring pineapples and surfing slogans. Harem pants come in an array of patterns from elephants and cockatoos to ferns, florals and Ikat. Comfy cotton shorts in solids and stripes easily mix with Blue Rooster’s fun tops. I know many mommy's who'd love to dress up in Mommy and Me wear with their handsome little men. Sizes range from baby to 6 years and prices from $36-$52. A brand that began as a cool, breezy, beachy line of clothing for kids, Pink Chicken is equally excited to launch its first swimwear line. Inspired by fan-favorite prints from ice cream cones and cats to florals, stripes and beautifully colored Indian woodblock designs, the collection includes bathing suits (both one- and two-piece), swim caps, and cover-ups with colorful tassels and ruffle detailing. 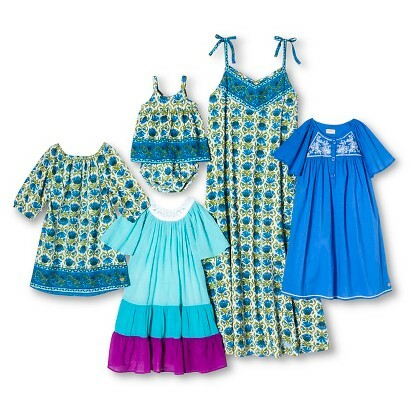 Sizes span from 3 months to 12 years and prices range from $44-64! The announcement of Blue Rooster and Pink Chicken follows the recent launch of Happy by Pink Chicken, their new apparel collaboration with Target. Yes, Target, The place where you don't know what you spent all your money on! Happy by Pink Chicken is exclusively available on Target.com and features a brightly colored and boldly patterned 38-piece collection of dresses and tops for moms and their mini-mes in stand-out prints from florals and tie dyes to watermelon and elephant patterns. For Happy by Pink Chicken, Sizes range from newborn to women’s ready-to-wear items and prices from $24.99-$39.99. That's just perfect for summer time and I can't wait to get my hands on a few pieces!